Everyone is finding new living space for entertaining, finding a quiet zone, or creating amenities worthy of a staycation. Patios are excellent areas to upgrade because remodeling this square footage increases the space you have to use. Making your patio space more versatile creates room for the family to spread out and maximizes the functional space of your property. You also gain greater access to the beauty of the outdoors and fresh air within a comfortable space. Here are just four ways that you can upgrade your yard and patio. Creating a focal point on your patio is easy with a fire feature. A stunning fireplace with sleek lines fits into modern deck designs with hardwood floors and comfortable seating arrangements. Fatter, rounder designs fit well with patternless patios, such as those paved with cement. Adding other features, such as a fountain, can be used to provide a quiet place where anyone can take a few minutes to clear the head or leave stress behind. A sculpture provides beauty and can be any size to fit on small or large patios. Whatever you use as the focal point of your patio, whether functional or purely decorative, you’ll find an increased sense of relaxation and luxury when you incorporate an added feature into your patio space. Outdoor seating can extend your living space and create a stunning area to catch up with a friend or family member, relax in the fresh air, or gaze at the stars. 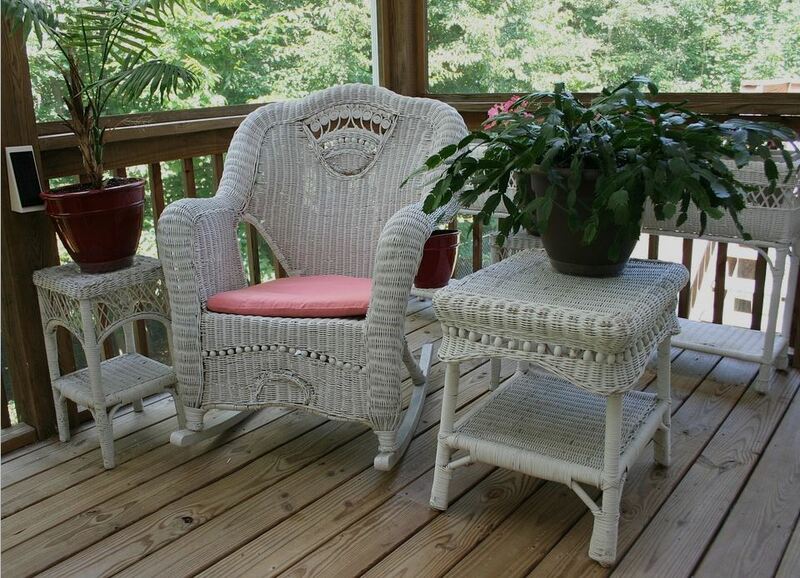 Wicker furniture is a popular and inexpensive item you can pick up in most furniture and garden stores. It prevents pooling of water in rainy weather, allowing it all to pass through for quick drying. Metal is also a good option for those looking for something that is easy to clean and weather-resistant, and plastic chairs that are easily stackable are excellent for those who need more than just one or two chairs but don’t have a large budget. Porch swings, wrought iron benches, and vinyl seats are other popular patio items that give your guests and family room to get comfortable. Any patio will feel better with some greenery. Plants clean the air in your yard, and there is nothing like fresh herbs to make homemade spaghetti or mint tea. Herb gardens can be set up easily along a vertical plane, allowing for easy access and minimizing the space needed. In small spaces, you can also use colorful containers and pots to plant bell peppers and tomatoes, and hanging flower baskets are easy to install and beautiful as decorations. For larger yards, a space can be cleared near the patio for a full-sized garden with a path leading from one to the other, and flowerpots on the patio itself will tie the whole yard together. Convertible furniture and hidden storage are two trends that help people with little spaces make the most of any area. On your patio, you can tuck away cards and board games in ottomans with hidden chambers. Use an outdoor table with room for bins to hold tissues, pens, towels if you have a swimming pool or snacks for game night. Benches that open to hold large items can store sports equipment making it readily accessible without being all over the yard. If you have lots of outdoor toys and a small budget, you can also get a large, short bin with a lid that can double as a table and storage. Your patio can make your lifestyle more comfortable by giving you a space to enjoy. Stepping out into the backyard with friends or family, whether for large gatherings or to have quiet one-on-one talks, can be a great source of relaxation for anyone who enjoys a bit of fresh air. No matter what size your deck, there are many furnishings and decorations that can increase the functionality of your patio.